This week’s color for Summer of Color is lime green and purple. It is a favorite combination for me. This week I decided to use inktense pencils. I really love them, both as watercolors pencils and as ordinary pencils. For this lovely I used them both dry and wet, and I must say I like it as it gives more depth to the page. The girl, I found in the pages of an old Cosmopolitan magazine. I like to use these models as they often have poses that we normally would not think of using. I usually change the face a bit so it is not recognizable. With this girl I loved her hair and the way her arm was raised. I had wanted to use that quote for ages, and felt she looked as if she could have said it. Have a great week everybody and I can’t wait to check out all the different takes on this color combination. Thank you Kirstin for hosting this event, it is certainly lightening my winter up! 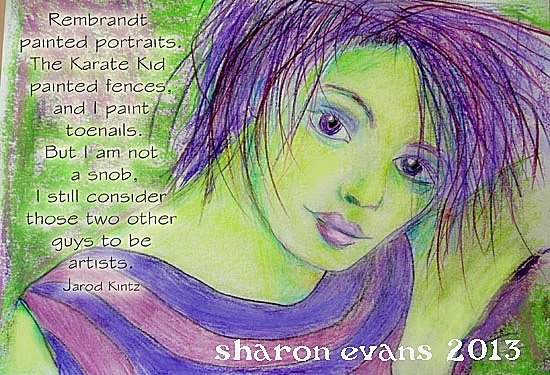 Great quote and a beautiful piece of art done with the inktense pencils. I love the vibrancy of those pencils and you have worked magic with them. I can tell it's a favourite of yours Sharon as you have made a fabulous piece of artwork here! Love this. Great image and the colours work beautifully. WOW Sharon, another stunning artwork of yours. I can see, that you love these colours. You've used them perfectly! Really adorable! this is so beautiful! The colors are gorgeous! she is beautiful Sharon!!!! wonderful work with the colours this week!!!! Oh, I love this Sharon. She's beautiful, and that colourcombination really looks very good. what a fantastic quote Sharon and what fabulous make on this color challenge! Adorable! I love that quote, too, I even think it is very funny. these colours bring Shrek to mind! Beautiful work! Hi Sharon, and thanks for your nice comments on my blog! I love the week 3 colours, too, and the model girl you created with them. Great quote, too! That's so funny, briliant. I needed to laugh a bit. Your girl looks stunning, sweet and a bit arrogant. Love her! Nice job with recreating the girl from the mag. I've never heard of inktense pencils...will have to google that one. I love this! And clearly I have not taken full advantage of my intense pencils, she turned out so beautifully. thank you for making me laugh, great quote! such a great gal! i love those pencils too. Great work - she's turned out beautifully, and I love the quote! very beautiful and she looks spunky enough to have said the quote! love it! You have made purple & lime green beautiful together! She is a beauty. WOW!! She is stunning, I love the way you played with these colors!! Her hair is AWESOME!! Great quote too!! It's such a lovely girl! The technique with the inktense pencils looks great! Fabulous textures created with the pencils. She is gorgeous. This is so awesome and very beautiful, Sharon! I love that quote, too!